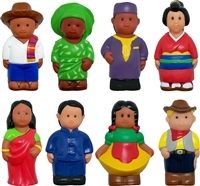 5" figurine collection features multicultural community helpers, ethnic families, special needs and interesting characters from around the world. 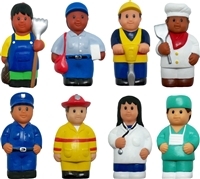 Large 5" chunky multicultural career figures for creative play and block play. The friendly multicultural characters help teach about safety, health and community. Large 5" chunky multicultural figures for creative play and block play. The friendly multicultural characters help teach about family and community. Large 5" chunky multicultural family figures for creative play and block play. The friendly multicultural characters help teach about family and community. Large 5" chunky multicultural Asian family figures for creative play and block play. The friendly multicultural characters help teach about family and community. Large 5" chunky multicultural disabilities figures for creative play and block play. The friendly multicultural characters help teach about health and community.